OK, so every time I make this soup, it turns out differently. But it is delicious each and every time. Here’s my question for you, fellow soup savants: Why is it when you remake a tried and true soup recipe, the end results can turn out so differently? The art of making soup is just that. It’s an art, not a science. Still, it’s amazing how different one batch can be from the next — even when you actually follow the recipe. Case in point: The following Lentil Swiss Chard Soup that I found on food.com. In any event, I like this recipe a lot … it’s got a lot of spicing in it and is more like a very healthy chili. It may vary from one batch to the next, but it’s always good. Place all ingredients in a 5 to 6 quart crockpot, stir, and cook for 4 hours on high or 6 to 8 hours on low. Lentils and other vegetables should be cooked but not overly soft. Remove bay leaves, stir and serve with fresh baked cornbread and jalapeno pepper sauce on the side. 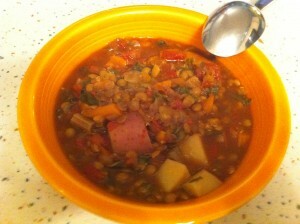 This entry was posted in seasonal, vegetable soups and tagged lentils, summer, swiss chard, vegetarian by soupbabe. Bookmark the permalink.